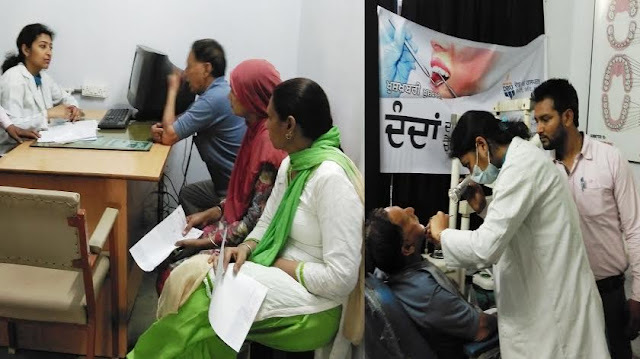 In best bds dental colleges in Punjab, Desh Bhagat Ayurvedic Hospital organised a free Dental check-up camp at the hospital. A team of doctors headed by Director of the University Faculty of Ayurveda and Research Dr. Kulbhushan and consisting of Dr. Sonal Aggarwal along with Dental assistant Satnam Singh and staff members examined more than 125 patients in the camp. 50 students of Desh Bhagat Global School were also examined by the team. While giving details, Dr. Kulbhushan disclosed that during this camp, medicines were provided either free of cost or on subsidised rates. Some tests were also done free of cost. The medical team also advised the people about proper cleanliness of teeth, healthy eating habits and to keep away from spicy and junk food. Desh Bhagat University Chancellor Dr. Zora Singh and Pro-Chancellor Mrs. Tajinder Kaur appreciated the medical team for their services and appealed to the people to get maximum advantage from the services being provided by Desh Bhagat Hospital. Hospital Superintendent Dr. Kamaljeet Singh Ahuja said that the hospital is organising awareness programmes relating to health problems and life style disorders from time to time. Patients were highly pleased and contented with the treatment and the facilities provided by Desh Bhagat Hospital during the dental camp.